We’ve had a busy week. We’re STILL having a busy week. But this is good. Not nearly as good as the fact that we’ve survived a whole lot this Christmas season, though. And not nearly as good as the clear evidence that God really does answer prayer centered on His glory, which we’ve known in theory but now know in reality. We’re thankful that God has patience with us as we learn these things and that He does indeed work all things out for the good of those who love Him and are called according to His purpose. The week started with a missions emphasis at church on Sunday. If you’re Southern Baptist, you know that we only care about missions at Christmastime. Just kidding about that. We care about it year-round, but the big push for giving comes in December when we take up the Lottie Moon Christmas Offering, the proceeds of which go entirely to sustain and support our foreign missionaries in the work they’re doing overseas. For those who don’t know, Lottie Moon was a missionary to China during the late 1800s who eventually died after giving all of her food away to the starving Chinese that she served. Ana heard the story at Mission Friends and shared it with me, saying that, “Lottie Moon was Miss Lisa’s granddaughter, and she was lost, and she gave cookies to the people in China!” Wow. I didn’t even know where to begin in untwisting all of those details, but we’ve been re-telling the story and getting it straight this week. I think. We had a career missionary couple speak at a luncheon at the church, then a journeyman who grew up in our church spoke during the evening service. We also had a birthday party for Jesus, and the children of the church sang a couple of songs during the morning service. So much fun! And such a great time for our church to be confronted with the enormity of the Great Commission task before us. The girls and I started praying through the IMB’s 2010 Week of Prayer for International Missions booklet that night. For those of you who are sticklers, we are indeed a week late on this. I blame our pastor, because that’s what everyone else does. (Just kidding on that. Well, on part of that, at least. I certainly don’t blame our pastor for anything.) The girls and I were talking about Thailand before we prayed for prison ministry there, and Ana, who has been hearing about poverty and those in need quite often this holiday season said, “Do they not have many things in Thailand?” I told her, “Well, they probably have many things, but do you know what they really need?” “What?,” she asked. “Jesus. Many people there have never even heard of Him,” I said. She thought about this for a second, then replied, “We should go to their house and tell them about Jesus! Do you think God would let us go to Thailand?” And for a fleeting moment, I pictured a still tiny collegiate-aged Ana, getting on a plane to Thailand for a journeyman term. “Maybe one day,” I said, “God will let you LIVE in Thailand so you can tell people about Jesus.” She smiled. “That would be good!” I think so, too! The girls also spent some time this week making and decorating Christmas cookies for the widows and shut-ins of the church. 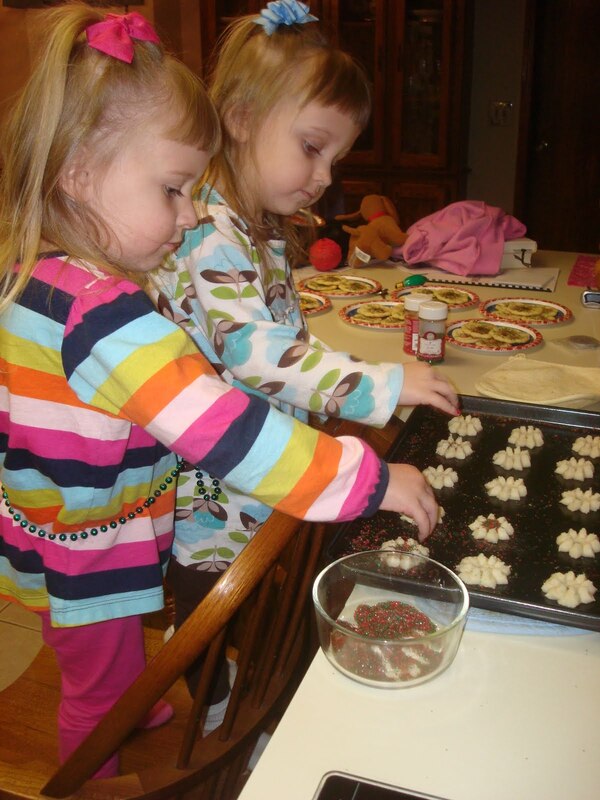 They were excited about using the cookie press (I include that link so you can rush out and buy yourself one, because it’s worth every last penny, especially if you have little ones), but they were even more excited about using the red and green sprinkles to decorate the cookies. I kept telling Emma, “Just a pinch of sprinkles,” but she kept grabbing whole fistfuls of the stuff and chunking it towards the cookie sheet. It was awesome. The finished product still managed to look great, and the next day, we bundled up, took our cookies out to the car, and spent the whole day visiting people with Wes. I’m amazed by how much more excited people are to see Wes when he comes with the girls. (One sweet lady even told Wes that she would have sent him home to get them had he come without them this time. Ha!) Ana and Emma did great for the first eight visits, but then, the squirming began. Those sweet ladies didn’t seem to mind, though… or at least they pretended that they didn’t. One of them even told me, as Emma was climbing me like a monkey and Ana was holding my neck in a death-grip as she tried to whisper to me about how many cookies were left in the car that she thought they were so well-behaved. God bless her for that sweet, sweet lie. We took the children of the church to the Toy Shop on Wednesday night. The Toy Shop is a ministry here in town that collects toys for needy families at Christmastime. They have a really big toy center where volunteers come in during the month of December and pack boxes of toys for the families who have provided lists for their children. I didn’t even know this place existed until this year, but it was a big treat for our children to get to go and see how groups can come in and “shop” for families. Ana’s school took donations to the Toy Shop earlier this week, so it was especially fun for her to get to see where the pink Zhu Zhu pet that she bought went. And it was helpful to us, as we’re trying to teach our girls about helping others where we are as well as helping those around the world. They have no trouble picturing our Compassion children and praying for their needs, but I think there’s some disconnect when it comes to our own “Jerusalem,” since Ana assumes no one can be in need when there’s a Wal Mart just down the road. (Because Wal Mart does indeed have EVERYTHING.) I’m hopeful that we’ll be able to do more at the Toy Shop next year now that we actually know about it! We’re finishing up the week by helping Wes to plan a party for the young adults and youth of the church. Oh, and then GOING to that party. Someone wasn’t very smart when she scheduled that at the end of the busiest week ever, and that someone was me. Ha! Oh, well. Emma and I have had some big fun coming up with games and door prizes for it. She’s super helpful that way. Thanks for Blessing us and inspiring us. Amen! What a blessing your blog is! I love reading and being encouraged! I LOVE how you LIVE Christ out and teach your girls! You are an inspiration…and iron sharpens iron.